In a seminal book about the origins of the alphabet, Byblia Grammata, Maurice Dunand writes: "This great and awesome invention was born around the same time in Egypt, Phoenicia and Mesopotamia, at the beginning of historical times. It was very imperfect in its first states. During the first half of the second millennium alphabetical writing appeared and this new step marked a considerable progress in the history of humanity. This step was taken in Phoenicia, maybe in Byblos." The rest, as they say, is history, but grievously little is known about the actual process of the creation of the alphabet. 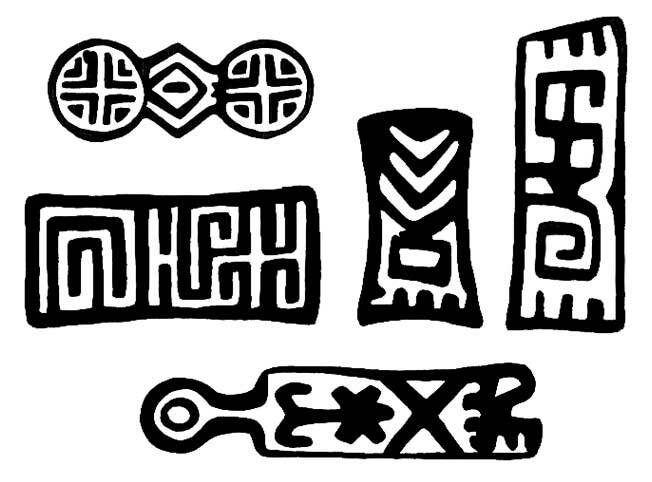 * The motifs and seals used for these imprints, as well as other features of the Eneolithic civilisation of the time, show many affinities to Mesopotamia, but the exact relationship between them has not been elucidated yet (in other words, it would be hasty to conclude that either one is derived from the other). Some of the imprints found in Byblos, belonging to different periods. conveying the cattle belonging to the gods. The introduction of copper technology by the Northern invaders c. 3200 BC upturned the social order. Metal had been used before but never been so available: it was such an incredible discovery that it instantly became indispensable. Convoys had to be sent to the mines up North to bring back the mineral: society suddenly found itself forced to break up, mix and expand, because the small groups could no longer be self-sufficient. Sending members away involved the new necessity of sending decisions along with them in a durable form. Mankind had no choice but to find ways to transmit thought through time and space. The first step in this is iconography, i.e. the use of images that express what the sender wishes to say. More elaborate is pictographic writing, which decomposes these images in order to make the meaning clearer; this is as far as the Egyptian and Mesopotamian systems went, and in this they were the first. However, a startling discovery was that the end of the 3rd millennium BC, after the invasion of the Peoples of the Sea, the Phoenicians started using a hieroglyphic system of their own. Known as the Pseudo-hieroglyphics of Byblos, this system completely replaced the older imprints to mark craftsmen's works. 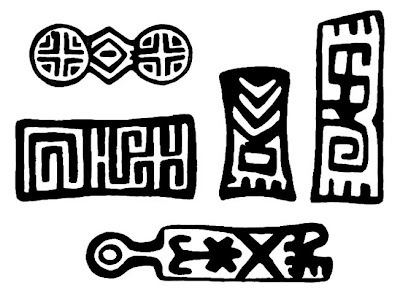 Only 114 of the characters are known, and they haven't been deciphered, although most are clearly recognisable as animals, plants, objects etc. They are also what modern designers would term "monospaced", creating beautiful, neat square grids when engraved. At the time Egypt was very present in the Middle East, and the influence of Egyptian hieroglyphics is undeniable, but only on the surface: the Phoenician scribes borrowed certain forms from Egypt, but not the writing system in itself, coming up with a completely different one of their own making (the writings of the Sinai, often brought up alongside Byblos, also present similarities with Egyptian writing, and they were used around the same period, but they don't seem to have had an influence on each other.) It is not excluded that the Northern invaders themselves could have created the Pseudo-hieroglyphics, after having come in their contact with the great Oriental civilisations: a feature that supports this is the complete absence of sea-related symbols in this script, something that would be very strange indeed in the sea-dependent people that were the inhabitants of the Phoenician shore. Since no trace of the Pseudo-hieroglyphics was found anywhere other than Byblos, ancient Gubla, the city must be credited for their invention, as well as for that of the alphabet that derived directly from them. Some of the future letters can already be spotted among the older signs, and many more characteristics (orientation, technique, location, punctuation...) show without a doubt that the alphabet descends from the Pseudo-hieroglyphics, and not from any other known system. It has been said that the Egyptians already used a mono-consonantal system, but in reality they were only incidental occurrences within a system that included tri- and bi-consonantal hieroglyphs. No separate lists of this "Egyptian alphabet" exists. "The Egyptians never realized that they had a potential independent system within their complex system", writes Zellig S. Harris in A Grammar of the Phoenician Language. As for the alphabet of Ugarit, it seems to have been born of a desire to adapt the Byblos alphabet to a non-Semitic language, in other words an early imitation, and unlike the Byblos alphabet that gave birth to all of today's alphabets across the world, the Ugarit attempt led nowhere. The two oldest examples we have of a complete Phoenician alphabet are the Mesha stela, found in Transjordan and dating back to 842 BC, and the sarcophagus of Ahiram found in Byblos. Yet these inscriptions already show sign of a long use of the script! For lack of archaeological evidence we don't know exactly when the alphabet rose out of the earlier script, but we do know that it was fully operational as early as the 18th century BC, and that it existed alongside the Pseudo-hieroglyphics for a while. These 22 signs were able to express all the consonants of the Phoenician language. Due to the nature of Semitic languages, it was unnecessary to note the vowels; indeed this deliberate omission was one of the factors of the alphabet's worldwide success. All other languages could easily complete it with their own vowel system, like the Greeks did. The Greeks also adopted the names of the letters, almost intact, (as did the Hebrews) and the nomenclature remained attached to the signs even when they were modified by these cultures. The words Aleph, Beth etc make sense in Hebrew, because it was practically identical to Phoenician, but they are nonsensical in Greek – in itself a proof that they were indeed an import. For a long time it was believed that the names of the letters corresponded to the objects that inspired their creation. This seems to be a misconception, and that in truth is the names assigned to the letters were only a mnemonic device (memory aid) created after they were already fully formed. The inventors looked at the letters and tried to see in them an image of objects whose name started with that letter, to make it easier to remember how to write them. The correspondences can therefore be a stretch at times – they only needed to fit enough to be efficient "flash cards". Alef: "ox". Contrary to myth, there was never an "original" letter with upwards-pointing horns. Beth: "house", more specifically the double-sloping roof house. Gimel: probably a dialectal form for gamal, "camel", whose characteristic trait was the hump. Daleth: a door. In the double-sloping roof houses of Byblos, the doors tended to be triangular in shape. Hé: this is not a word, as nothing fitting could be found; it's merely the letter followed by the sound é, much like B is pronounced Bee. Zayin: this word is connected to a word still found in Hebrew and Arabic today, that means "to weigh", so it probably means "scale". Khêth: Not so much "wall" as its relative "enclosure, barrier". Têth: connected to a root that means "to spin" or "to roll [into a ball of yarn]"
Yôd: A typically Phoenician word that means both "hand" and "arm" (and still does in Lebanese form eed today). Kaf: "hand", and mnemonically it makes sense to find this association coming right after the above. Lamed: seems to designate the teacher's stick, definitely not a shepherd's goad. Nûn: a large fish, more specifically a cetacean, and the shape of the letter does evoke the curved body of the dolphin which was common in the Mediterranean. This word had disappeared from Hebrew early on but was preserved by the Phoenician names of letters. Samek: "support", more specifically a vine tutor that is usually made of a small tree of which only the horizontal branches were kept – a perfect match for the shape of this letter. Tsadé: could designate a hunting or fishing tool. Resh: Aramaised form of rôsh, "head". Taw: this is a mark that two parties have agreed upon, cf Ezechiel IX, 4: "you shall mark with a taw". The letters could also be used as numerals for calculation: each of them was given a value (A=1, B=2, etc), starting with units, then tens and hundreds. At the beginning of the first millennium BC, the Greeks borrowed the Phoenician alphabet and adapted it to create their own. Herodotus writes: "As they used these letters, the Greeks made them known, as was only just -- since the Phoenicians had introduced them in Greece -- under the name of Phoinikeia." The inventors are also credited in the very interesting story of Cadmos and Europe. An analysis of this myth reveals how much the Phoenicians influenced the early Western cultures. The Phoenician alphabet remained in use among the Greeks even after the latter turned against them: originally friends and grateful heirs of the Phoenicians, the Greeks started to want an expansion of their own, which was made difficult by the fact the Phoenicians were already everywhere in the Mediterranean. The Greeks had to use force to take over some of the settlements. Alexander's conquests in the 4th century BC only spread the alphabet further, and the Roman Empire later extended it to the totality of the Western world, from where it was finally exported to the New World. In the East, the alphabet was adopted by the kingdoms of Israel and Juda and by the Aramean and Nabatean people. 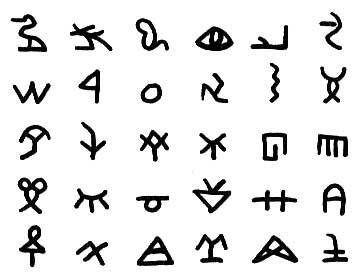 These peoples modified it respectively to give birth to the Hebrew and Arabic scripts. The reason it evolved so much in this area and almost not at all in the West lies in the opposing tendencies of the two: Orientals have a clear tendency towards abbreviation (cf. the Arabic script, where some letters only differ by the presence of a dot), while Occidentals on the contrary tend to be more conservative of forms. Ancient texts besides Herodotus' show that the peoples of Antiquity already knew what archaeologists have re-discovered: that though the first use of written signs is to be credited to Ancient Egypt (or Mesopotamia, nobody's quite sure), the glory of the invention of the alphabet should be reserved to the Phoenicians. Their long cultural history and their democratic thinking allowed them to invent a way of writing that would be easily accessible to all and not just the ruling classes. Their ability to think in abstract terms allowed them to take the complex step that separates ideographic language and symbolic language. 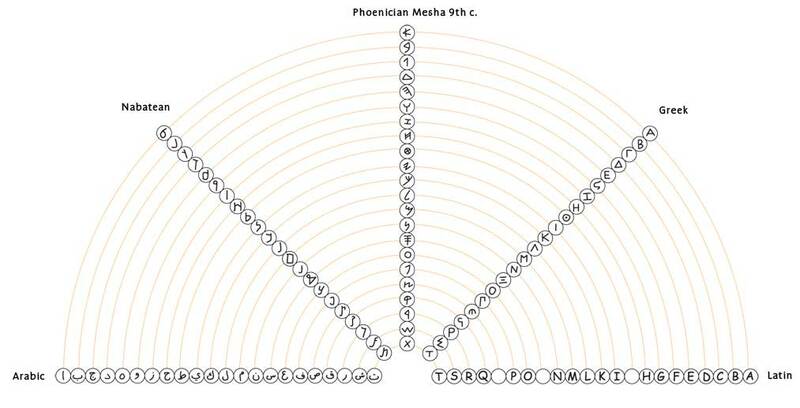 The Phoenician designers of the alphabet moved away from the concreteness of a thing towards the abstractness of sound. They broke down language to its very minimal units of sounds and managed to represent the voiceless sounds that are the consonants – "translating" thought as opposed to the Egyptians' "reflecting" it. The genius behind this system is evident in the fact that in 35 centuries, nothing better was found and only minor modifications were introduced. The Phoenicians of Byblos had attained perfection at their first attempt: "The alphabet was only invented once."